More reviews forÂ Leaving the Hall Light On.Â Hopefully, after you’ve read the book you’ll let me add your endorsement to this page. I finished Leaving the Hall Light On last night.Â It is a very moving, very intimate and very inspiring memoir.Â It must have taken great courage to reveal your story to yourself and your family let alone to the world at large. Â I have huge respect for the way you have exposed your feelings for Paul, Bob and Ben with such candor; it is something that it would be impossible for me to do probably because I am a reticent Brit.Â The poetry and photographs add an extra dimension that is missing from most memoirs like this since as a reader you get much closer to the reality of what is being described on the page.Â For 321 pages I was completely caught up in your life and the heart-wrenching drama that you were experiencing. What came across for me so eloquently was how hard you tried to make it right for Paul despite all the obstacles he put in your way.Â And, then at times you realized you had to back off and take care of yourself and your marriage.Â This I believe will be most helpful to readers who are in a similar situation â€“ that as a parent you canâ€™t continue to be a victim to the behavior of your child and that at some point you have to let go and take back your life. Â It is a great credit to both of you that you were able to hold your marriage together since I know that even the best marriages fall apart in these circumstances; I have seen it happen to close friends of ours in Santa Barbara. The world is a better place for your having written and published this book.Â I hope and pray it finds a huge audience. Leaving the Hall Light On left me in tears. It isÂ a heart wrenching book;Â I could not put it down.Â Anyone who wants to learn how to live with children or adults with bipolar disorder, must read this book. I encourage others to read your book because while it discusses a terrible, tragic event, it is not a book of tragedy, but one of living through and coming out the other side and knowing who you are as a woman and what you can do and give and need…it truly a mother’s story and it really has spoken to the mother in me. Since I didn’t have the pleasure of knowing your talented son personally, for me he has become the representation of the thousands of young men and women with bipolar disorder who struggle to hang onto the life of their dreams, searching and hoping for a medical breakthrough. I hope one day there will be such effective treatment for mental illnesses like bipolar disorder that no mother need ever write a book about her child’s death. Till then, we are fortunate that you found the strength and fortitude and open-heartedness to tell yours, and Paul’s, story. From the moment I started reading this memoir, I couldn’t put it down. It leaves the reader feeling positive about the future and good about tackling any obstacles that may come his/her way in the years ahead. I could really empathize with the author and her family. A fast and easy read! Madeline Sharples examines her son Paul’s bipolar disease and subsequent suicide with ruthless introspection and integrity, and thus authenticity. As a poet she brings a facility with words and literary perspectives, but as the spouse of an engineer and having worked in the aerospace industry herself, she also brings a narrative clarity and specificity that makes the story real to the reader. The author, her husband, and her two sons are the characters at the heart of the book, made real not only by crisp prose, but also by photos and extracts from letters or diaries that they kept. There is love among the family survivors, but also different responses in grieving, and the author does not avert her attention from the stresses that those differences bring. Paul’s character is conveyed not only though discussions of his childhood up to the onset of bipolar disease when he was 21 and when he committed suicide at 27, but also as he lives on in her poetry, both as a beloved son, and as a bully who pushes his way into poems she’s writing about other people. If this were a Hollywood story, it would build up to a climax perhaps in the immediate aftermath of his suicide, and then there would be credits and music, but reality doesn’t have credits, it just sometimes has unfair events, and people who live on afterwards trying to cope. This isn’t a Hollywood story, and in fact, one of the many little details that helped make this more real to me was her description, late in the book, of publishers who were not interested in her manuscript because it didn’t result in something dramatic like alcoholism or adultery. Another telling detail was her description of the behavior of some former friends who cut off contact with the family after the suicide, in contrast with the behavior of a neighbor who had always annoyed her, but at their time of need was there to help. More central to the narrative are all of the specific challenges that she had to face, from treatment options for an adult child with bipolar disease, to the question of what to do with the bedroom in her house where her son last lived (answer: many years later, turn it into the room to write). And most importantly is the author’s own narrative which is not about “recovering” from this tragedy, but instead over many years coming to a new normal forever changed by her son’s disease and death. I could imagine that this book might be helpful for those dealing with bipolar disease or suicide in the family, but for those of us fortunate enough not to have yet experienced those problems, it also provides a very real look into how good but human people deal with the cruelty of fate. Suicide does not just end one life, it can destroy others. 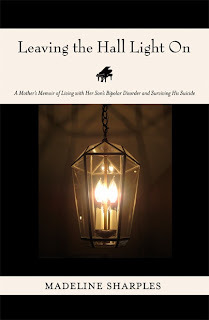 “Leaving the Hall Light On: A Mother’s Memoir of Living with Her Son’s Bipolar Disorder and Surviving His Suicide” is the story of a mother coping with the reality of her son’s choice of suicide. Sharing her own story and with words of encouragement for other mothers facing this pain, as well as wisdom on bipolar disorder, “Leaving the Hall Light On” is a moving read of tragedy, trying to prevent it, and coping with life after. Being the parent of a child with bipolar disorder, Iâ€™ll admit, this memoir was hard to read. The emotion is raw and right there on the surface. Madeline is frank and honest as she brings you into not just her world, but her heart. Over cup after cup of hot tea, I allowed her to pour her heart out to me word by word, page by page winding me through her sonâ€™s life. All his ups and downs are so carefully remembered, seared on her conscious as they are. There are pictures and poems woven throughout that pull the name, Paul, out of the jumble of letters and turn it into a face, a person, another life touched by bipolar disorder. Madeline has been through our worse nightmare, the loss of a child to mental illness and stands here, still, on the front lines with us sharing her story and fighting stigma. This book is a stark and real look into the life of parenting a child with mental illness. Leaving the Hall Light On by Madeline Sharples is truly one of the most inspiring books one might find on coping with a mentally ill child, and then facing the loss of that child through suicide. The text, photographs and poetry within this memoir describe a loving family who tried desperately to get help for their adult son as he struggled with his bipolar disorder. Though their battle to save their son was lost, a story emerges of remembrance and the coping skills the author found crucial to a healthy life after, one as far from paralyzing grief as one might hope to go. After reading this honest memoir the reader will be impressed by the strength and life-affirming perspective of a mother who found her way to healing and peace. Coping with a son’s suicide and bipolar, surviving, and sharing her tragedy Madeline creates a Must-Read!! I finished Leaving the Hall Light On within 48 hours of buying it !!! I thought it was magnificent! I was so moved and had many moments where I wished I could just reach out and hug Madeline … Her writing is exquisite. Madeline, you were so raw and honest in your description of your journey through Paul’s illness and suicide, as well as the path you so bravely chose since that day in 1999. I am in awe that you did it all on your own without even taking anti-depressants. I am so inspired by your courage and survival instincts/choices. The love story of your 41 years with Bob was also beautiful. The way you shared both the ups and downs and differences in your reactions to Paul’s illness showed how your love did somehow make the intolerable possible. I am anxious to share this book with anyone who has experienced either suicide of a loved one or bipolar illness. This book is a testament to the power of the human soul. It shows the strength of a woman and a family who had to go through the worst human tragedy, and get to the other side in a loving, peaceful and compassionate way. This is the most honest and heartfelt story about losing a son to suicide. She just tells it like it is and anyone can relate to that. They were just a normal regular family who had the worst happen to them. They all got out the other side stronger, closer, healthier, productive and positive. It makes you feel that nothing is too painful. Madeline Sharples lovingly tells the world that anyone can come out the other side, healed and excited about life. I cannot recommend this book more highly. I could not put it down. I loved this book. It make me want to run 20miles, eat healthy, write, create, see my friends and live my life to the fullest. Madeline is an incredible writer that leaves you wanting more. Extraordinary!! This book spoke to me in so many ways. I felt I knew Paul through Madeline’s words. I am still struggling with the passing of my son, Justin, 34 weeks ago and this book offered me hope that my grief can soften and my life can continue on. I recommend this book to not only those who lost a child or who struggle with the mental illness of a child but to anyone at all who wants a deep, intimate read where the author bares her soul and lets you into her world! A stunning book brilliantly providing a detailed accounting of the impact to the author’s family of a son who developed a bipolar disorder in his early twenties that eventually led to his suicide. The family recovered, but will never be the same. Each family member – the parents and another son – developed his/her own coping techniques, described in the book. The storytelling is compelling and brutally honest. Aside from its considerable literary value, my hope is that many will read this book to better prepare them and those they know should a similar tragedy befall them. A deeply moving and sublimely written account of living through a horrendous personal tragedy. “Leaving the Hall Light On” by Madeline Sharples, portrays her innermost feelings about the worst tragedy that could happen to a mother – the death of her son by suicide. The questions follow: Why did it happen? How could it have been prevented? What did she miss? In the book, she exposes her deepest personal thoughts and the rawest of feelings, including her love-hate relationship with her sick son – a shocking admission. Her story is made even more poignant by her beautiful poems sprinkled liberally throughout the book. I found the transitions from prose to poetry and back quite natural yet all the while remaining within the context of the story’s flow. The depth of honest emotions, that pour from its pages, made it tough for me to put the book down. Madeline Sharples’ writing articulates the challenges of bipolar disorder and offers a captivating narrative, encouragement and a testament to the strength of the human spirit. I was very moved by this book. It touched me in several ways. While the situation that Madeline lived through was tragic this story did not dwell on the tragedy. I was inspired by how the family dealt with a very difficult situation. I could hardly put the book down once I started reading it. I came away with a much better understanding of bi-polar disorder and suicide, and how all that can affect an entire family. I highly recommend this book. Madeline Sharples has written an honest account of her son’s battle with bipolar disease that resulted in his committing suicide. She is a very talented writer and her poems are heart-wrenching. As the mother of a suicide I can relate to so many of her comments. I hope her book will become a source for others who are attempting to cope with bipolar disorder and what suicide does to the family left behindâ€¦. Madeline Sharples is a very talented writer on a very painful subject She writes with honesty and knowledge of bipolar disease and suicide. As the mother of a suicide victim, I can attest to the validity of this bookâ€¦. This book is a must for anyone coping with suicide and bipolar disorder and the aftermath. I was very moved by this book. The poetry in every chapter was inspirational and beautiful. I read the book twice and felt a range of emotions each time. This is a story about loss and rebirth. A short life does not mean an incomplete life. I highly recommend this to anyone who is ready to explore their deepest feelings. I first met Madeline at a poetry workshop at Esalen. She wrote poems about Paul, and I found them stunning and heartbreaking. Over the five or six years I’ve seen Madeline at workshops, I’ve watched how her grief and her writing have evolved. I am so grateful she wrote this book and shared her experience with the world. I so admire her honesty, her courage, and her need to work through writing. The book is incredibly moving and has much to teach anyone grieving the loss of a loved one. Or suffering any kind of loss — what she learns along the way can be applied to so much that people go through. I love the ending of the book. I love picturing Madeline in her office, looking out into her beautiful garden, writing, writing, writing. The title of this review may seem odd to some yet, as this phrase suggests, as I was reading, it felt as if I were a fly on the wall during the actual events portrayed in Madeline’s book. As an avid reader, those stories that pull me deeply into the experiences portrayed are books that I consider as 5-starred. When a story involves tragedy, my buttons of compassion, empathy and heart-felt commiseration must be involved. Chapter One, How It All Began, set the stage for me, delivering straight out the tragic incident that occurred yet moving me quickly into the earlier years of a family that shared love. If I had not previously worked in the field of mental health, my understanding of a person with bi-polar disorder would have been made complete due to Madeline’s descriptions of this emotional roller-coaster type of illness. More compelling for me was the author’s delivery of her own emotional roller-coaster ride of grief. At times, I felt a gut-level punch when reading words that spoke of the raw thoughts and emotions that the author experienced while trying to cope with a son’s mental illness and, later, with his choice to end his life. Madeline’s book took me along on a journey that she has been on for some time, always moving her towards a place of healing. Her real-life story depicts a journey that I would not wish to take yet it is one that I feel privileged to be allowed to share, as a fly on her wall. One could not read this novel and not have an enormous appreciation of the pain and heartache this family experienced through their journey of attempting to care for a loved one who faced the challenges associated with mental illness. For those of us who have walked a similar path – this book so poignantly describes how debilitating and isolating this experience can be for all concerned. Thankyou Madeline for your courageous and transparent reflections on this aspect of your family’s life. I’ve taken inspiration from Madeline Sharples’ stark, honest poems for over a decade, and I can now say I take inspiration from her book about son Paul’s suicide and the impact it had on her and her family. Madeline tells the unvarnished truth about how it was, and how it is now, and this is incredibly refreshing. But speaking of unvarnished truths, I can’t lie … this is a sad story to read, and it’ll just break your heart wide open, AND Madeline’s message is that heartbreaking events in our lives don’t necessarily ruin our lives forever. Madeline serves as a valuable role model for going TOWARD what you most want to avoid. I particularly recommend this book to parents or loved ones who are struggling to comprehend the strange behavior of their kid or loved one. It is hard to think that strange behavior could lead to such an unfortunate outcome as suicide, but I’d rather be exposed to such harsh possibilities than taken by surprise. I’d also rather see how different members of a family can be impacted in different ways, as Madeline reveals by sharing some of her husband’s and son’s responses. A big bravo to you, Madeline. You are so NOT contagious! It deals with serious issues like mental illness and suicide. The descriptions of manic depression and paranoia are accurate to a tee and forced me to remember things in my own life that I’d rather forget. The author doesn’t sugar-coat the situation. She is honest about her feelings. Number four is key, because as much as society claims to value honestly, we lie to ourselves ALL THE TIME. What’s worse? We criticize those who tell the truth. There’s a reason politicians lie. It’s because we want them to. So here is my bit of truth for this morning, one I’m sure will win me no friends. How often do we expect those that have lost a child to comfort us because we feel helpless? How often do we pull away from listening to someone talk about their grief or anger because we think they’ve had time enough to grieve? How often, in a culture that’s obsessed with fixing things, do we avoid those who have problems we can’t fix?Â I know I’ve done it. The thing that struck me the most after reading this book was how hard it must be day after day to go on living when you know your son is gone. What a struggle that must have been for Madeline and her family. What courage it took to live one day at a time. Paul’s death, final as it was, didn’t end anything for his family. Instead it began a long and slow process of denial, anger, sadness, bargaining, and ultimately healing. I am in awe of Madeline Sharples. What a powerful, emotional, and informative read. Thank you for sharing and for being so brave to write this book. May you continue to heal and grow through your writing. A book I’ll never forget. This memoir pins you down and never lets go. There wasn’t one moment where I wasn’t thinking about Madeline’s heartbreak, and Paul’s suffering, and anticipating the time I could sit down and read it again in peace. You want to immerse yourself in total silence while reading this extraordinarily powerful story. I’m not sure why I felt this way. Perhaps it was a subconscious act of respect. Perhaps I felt as if Madeline, Paul, Bob and Ben, needed my undivided attention. Actually, I think that is the reason. It was as if I wasn’t even reading, but watching the story unfold right before my very eyes. Who wants background noise when someone is pouring their heart out to you? I certainly don’t.Â I cried. Three times, in fact. The first time straight after the very first paragraph. The second time during one of Bob’s (Madeline’s husband) journal entries describing the scene of finding their son, Paul, dead, in a pool of blood, in their bath, throat and wrists slit. And the third time after reading a poem called “A Stone Called Son”.Â I don’t think I can justifiably describe how I’m feeling about this book. Tears are welling up in my eyes as I’m writing this, trying to figure out how to express myself. My gosh, I’m a writer and I can’t find the words to tell you how much I wish every single person on this planet would read this book. Because it will teach you not to judge. Because it will teach you how to behave around people who are grieving. Because sometimes you need a reality check. Because Madeline has written a book about one of the most difficult experiences in her life and it should be rewarded. Because you want to. Believe me, you do. No matter how heartbreaking the content, you want to read it. You will become a better person afterward. I tip my hat off to you, Madeline. You are a survivor. You are an inspiration. You make me proud to be a woman. Your book touched me in a thousand ways. I hope it will become a source for others who are attempting to cope with bipolar disorder and suicide. You hit the nail on the head so many times. You are a very talented writer and I wish you continued success. Your poems are so beautiful. Your book should be read by everyone – not only survivors – your style of writing, your honesty, your story, your inner strength….are incredible and inspirational.Â I doubt any person cannot feel moved after reading your book – as I am now….I’m not quite finished reading it yetâ€¦. I almost don’t want to get to the end….Reading it gives me such strength, courage and also a sense that someone else knows how I felt coping with Nat’s illness, there are so many similarities and I know I’m going to feel sad and a little alone once I finish it.Â (I really hope you know what I mean! )â€¦.Though heartbreaking, it’s the best book I have ever read – but wish you had never had to write…. I have your amazing book & am awed by your prose & your poetry.Â It is a very readable, wrenching & (for me) very personal book.Â I have all your images in my mind, and feel like I am walking in your shoes tho reading about it & experiencingÂ it are worlds apart emotionally.Â Congratulations on this achievement.Â IÂ hope writing itÂ was cathartic & therapeutic for you, even if it took 10 years before you were able to do it. I am so proud of you. Beautifully written, incredibly powerful, emotional, and dramatic. Â And I’ve only read the first half. Â Your dedication and devotion to an impossible situation is more than commendableâ€¦.More to come. Kim bought your book a month or so ago; she read it in two days and then let me borrow it.Â Madeline, you are one incredible woman.Â I cannot begin to envision losing any of my children; but I know in my heart of hearts there couldnâ€™t be anything worse than that. Thanks for sharing the book with othersâ€¦. I’ve just finished reading your wonderful book.Â I’m here now savoring it and you in my body.Â I love the poetry of it and you…..the courage…. the close to the bone truth telling…..the process of re-membering and healing…and all the ranges of the songs that you sing.Â Thank you for the gifts of your great heart, soul, tears, grittiness, musings, incantations, poetry, and the windows into family, beauty, heartbreak, humanity, Mystery. All good things to you and your family. It is really WONDERFUL! I have been trying to find something that isnâ€™t so clinical and this does the trick! It’s a pleasure to recommend your book for others’ reading and healing. I thoroughly enjoyed reading the book, Madeline.Â I hope it has helped you as much as it will help others who have lost loved ones. It can be used as a template for them to work through their own feelings. I knew Paul in college and saw his illness change him. The book describes the life of a humble, gorgeous, brilliant musician and his family’s struggle to save him, and then themselves, after his suicide. I couldn’t put this book down. The author’s deep love for her son is so moving. The book provides an education about bipolar disorder as well as ways to cope with loss from suicide. I am a therapist and would be happy to use this as a tool in my practice. The book shows how there are many different ways to mourn and how important it is to respect the differences between how we and the people around us choose to do it. The honesty of the author in describing her feelings and the brutal facts adds to the value of her message. People suffering from this sort of loss need a template like this for healthy healing and acceptance.